Pack the 21st (Sat) with family-friendly diversions at Ramoji Film City. There's much more to do: see the interesting displays at Salar Jung Museum, savor the flavors at SLN Terminus, admire the striking features of Chowmahalla Palace, and explore the historical opulence of Golkonda Fort. To see more things to do, other places to visit, maps, and tourist information, refer to the Hyderabad tour itinerary planner. Toronto, Canada to Hyderabad is an approximately 20.5-hour flight. The time zone difference when traveling from Toronto to Hyderabad is 10 hours. Plan for a bit warmer temperatures traveling from Toronto in July, with highs in Hyderabad at 36°C and lows at 26°C. 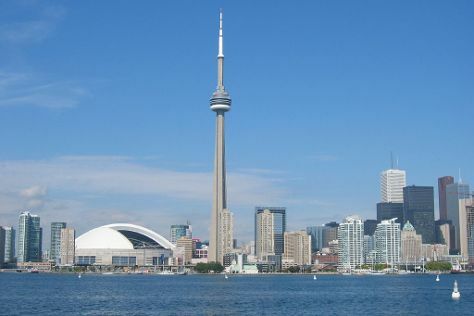 Finish your sightseeing early on the 25th (Wed) to allow enough time to travel to Toronto. Change things up with these side-trips from Toronto: Niagara Falls (Niagara Parks Butterfly Conservatory, Journey Behind the Falls, & more) and NEOB Lavender - Niagara Essential Oils & Blends (in Niagara-on-the-Lake). The adventure continues: enjoy breathtaking views from CN Tower, admire nature's wide array of creatures at Ripley's Aquarium Of Canada, explore the historical opulence of Casa Loma, and wander the streets of The Distillery District. For more things to do, reviews, maps, and other tourist information, use the Toronto trip planner. Getting from Hyderabad to Toronto by flight takes about 20.5 hours. The time zone difference when traveling from Hyderabad to Toronto is minus 10 hours. Plan for little chillier temperatures traveling from Hyderabad in July, with highs in Toronto at 31°C and lows at 20°C. Finish up your sightseeing early on the 31st (Tue) so you can travel back home.